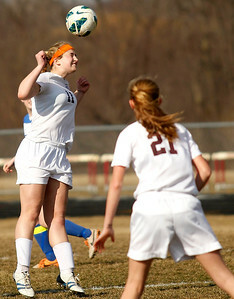 Matthew Apgar - mapgar@shawmedia.com Richmond-Burton's Sarah Weaver jumps up for a header during their girls soccer game against Johnsburg on Tuesday, March 31, 2015 at Richmond-Burton High School in Richmond. The game ended in a 1-1 tie in overtime. 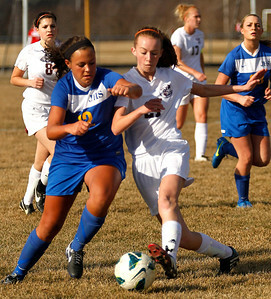 Matthew Apgar - mapgar@shawmedia.com Richmond-Burton's Gabrielle Ross, left, and Johnsburg's Anna Fox try to gain control of the ball during their girls soccer game on Tuesday, March 31, 2015 at Richmond-Burton High School in Richmond. The game ended in a 1-1 tie in overtime. Matthew Apgar - mapgar@shawmedia.com Johnsburg's Delaney Pruitt, left, collides with Richmond-Burton's Lauren Otto as they battle for control of the ball during their girls soccer game on Tuesday, March 31, 2015 at Richmond-Burton High School in Richmond. The game ended in a 1-1 tie in overtime. 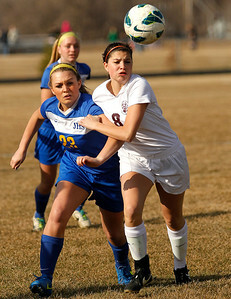 Matthew Apgar - mapgar@shawmedia.com Johnsburg's Taylor Piggott, left, and Richmond-Burton's Rachel Barrett chase down the ball during their girls soccer game on Tuesday, March 31, 2015 at Richmond-Burton High School in Richmond. The game ended in a 1-1 tie in overtime. 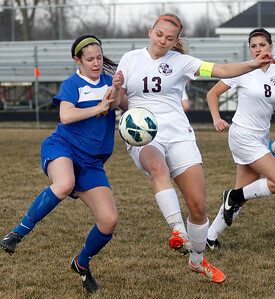 Matthew Apgar - mapgar@shawmedia.com Johnsburg's Madeline Hauck, left, and Richmond-Burton's Breanne Retherford battle for control of the ball during their girls soccer game on Tuesday, March 31, 2015 at Richmond-Burton High School in Richmond. The game ended in a 1-1 tie in overtime. 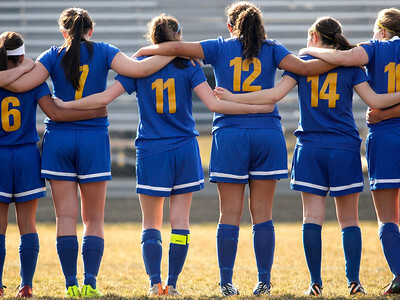 Matthew Apgar - mapgar@shawmedia.com The Johnsburg High School girls soccer team locks their arms together as introductions are made before their girls soccer game against Richmond-Burton on Tuesday, March 31, 2015 at Richmond-Burton High School in Richmond. The game ended in a 1-1 tie in overtime. 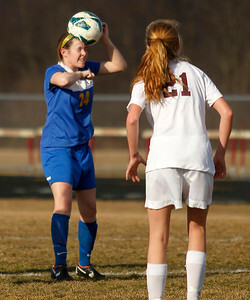 Matthew Apgar - mapgar@shawmedia.com Johnsburg's Delaney Pruitt uses her head as she connects with the ball during their girls soccer game against Richmond-Burton on Tuesday, March 31, 2015 at Richmond-Burton High School in Richmond. The game ended in a 1-1 tie in overtime. 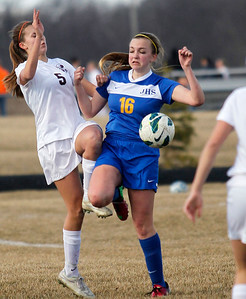 Johnsburg's Delaney Pruitt, left, collides with Richmond-Burton's Lauren Otto as they battle for control of the ball during their girls soccer game on Tuesday, March 31, 2015 at Richmond-Burton High School in Richmond. The game ended in a 1-1 tie in overtime.